Oftentimes, journalism makes a lot of noise, but little actual impact. You can report the hell out of a story, highlight outrageous injustices, outline sensible solutions, and still be left chanting "it just doesn't matter!" at the end of it. Ha! Take that, thief! You're about to learn that a hoodie sweatshirt-and-balaclava combo is an impractical fashion choice for those hot summer days! 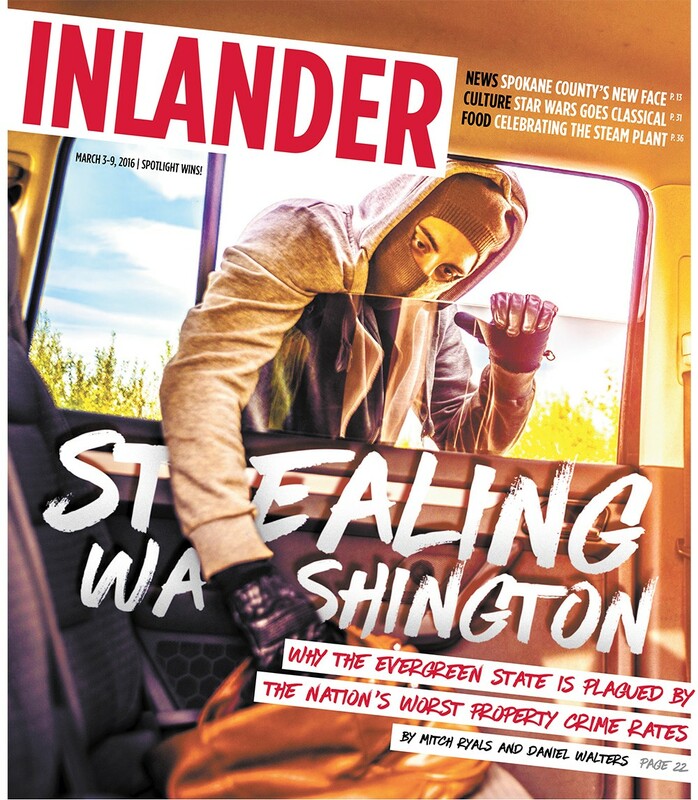 But the Inlander's recent cover story highlighting the epidemic of property crime in Washington state and Spokane was an exception. "I can honestly tell you that if the Inlander had not written that article, Spokane would not have $300,000 [to fight property crime,]" State Sen. Michael Baumgartner says. Of course, Baumgartner already knew property crime was a problem in Spokane. Everyone in his neighborhood on the lower South Hill, he says, has been hit by property crimes in the last five or 10 years. "[But] it really started bothering me after you guys wrote this Inlander article," Baumgartner says. "Let’s fix this," Baumgartner says. "What can be done?" He noticed that, at the same time, Seattle was experiencing a homelessness crisis, and seeking money from the legislature to address it. "If they’re having a homelessness crisis, we’re having a property crime crisis," Baumgartner says. His familiarity with the budgeting process, Baumgartner says, led him to believe that using a budget provision would be an effective way of bringing more funding to Spokane. "I went to [Sen. Mike] Padden and said, 'Hey Mike, what can we do for property crimes?'" Baumgartner says. "I had talked to [Mayor David] Condon and asked what can we do with it?" With help from Padden (a former judge) and Sen. Brian Dansel, Baumgartner managed to garner $300,000 to fight property crime in Spokane County. The Spokane Metropolitan Statistical Area, which includes Spokane, Stevens and Pend Orielle counties, had the highest property crime rate in the nation in 2014. Exactly what that $300,000 will be used for hasn't been determined. The Spokane Police Department has suggested it could be used for more automated license-plate readers, more cameras or increased public outreach with crime prevention tips. "When it comes to having folks in prison, I’d like to have more rehabilitation resources," Baumgartner says. He also thinks more criminals need to go to prison in the first place, but recognizes the financial limitations. "Sen. Padden and I are going to do a property crime summit later on this summer," Baumgartner says. "The situation in Spokane is unacceptable." This is the most impact the Inlander has had on property crime since that time we photographed a guy burning through a bike lock in broad daylight outside the downtown YMCA. The photo went viral, and after talking to the thief's mom and ex-wife, the thief was eventually arrested. The bike was never recovered. It's not the first time the Inlander has made a difference. Our coverage on school bullying caused the Central Valley School District to change how they addressed the problem. Our mental health coverage in 2014 sparked a class-action lawsuit, helped free a patient found to be neither dangerous nor mentally ill, encouraged the restoration of mental health funding, and inspired "Sheena's Law," requiring officials to notify family members if a firearm is going to be returned to a potentially dangerous person. More recently, our reporting that Asst. City Attorney Erin Jacobson would not be participating in the Straub investigation catalyzed City Council President Ben Stuckart to ask Condon to compel his employees to participate in the investigation. Condon, however, only responded that former Mayor Dennis Hession, acting as a city attorney in dealing with the litigation surrounding Straub, would be responding to Stuckart. Hession has not returned our requests for comment, and because the City Council's discussion with Hession took place in executive session, Stuckart says he isn't allowed to talk about what Hession said.